World's largest increases in oil production in the coming decades will be in Brazil's response. 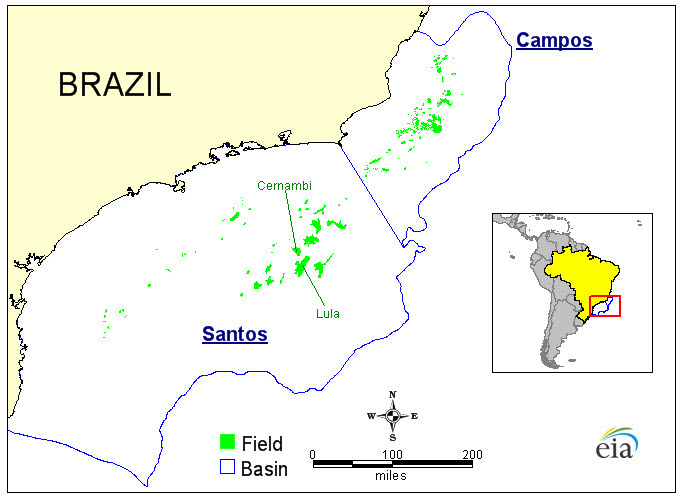 Petrobras advanced in seismic imaging that has enabled the discovery of offshore "pre-salt" deposits of oil in Brazil's Campos and Santos Basins (figure below). These pre-salt fields, so-called because they lie under massive layers of salt, are located 18,000 feet below the ocean floor under more than 6,000 feet of salt. Brazil's crude oil production exceeds 2.1 million barrels per day (bbl/d) and lease condensate. Pre-salt development, coupled with the ability to meet a large share of domestic demand with biofuels, is projected to transform the country into a major oil exporter since Brazil became a net exporter in 2008. 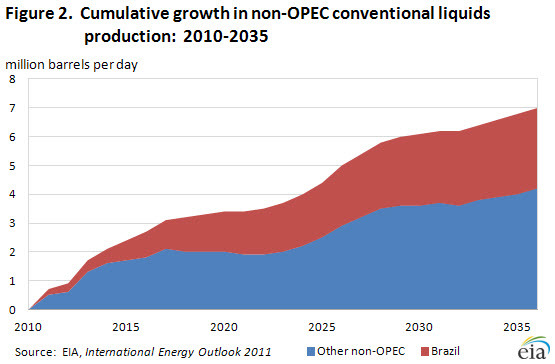 It has been projected that the largest increases in conventional liquids production outside of the Organization of Petroleum Exporting Countries (OPEC) will occur in Brazil (Figure Cumulative Growth). It has been estimated that Brazilian conventional production to grow to 4.8 million bbl/d in 2035. This means that 40 percent of non-OPEC growth over the projection period and 14 percent of total world production growth in conventional liquids will come from Brazil. After 2015, the EIA liquids supply projections are based on resource availability and the economic viability of production. While a massive resource base underlies EIA's projections of Brazilian production growth, the exact magnitude of the country's reserves is still unclear. According to Oil & Gas Journal, Brazil's proven oil reserves are currently estimated at 12.9 billion barrels, but this total does not include major pre-salt fields. Estimates of Brazil's pre-salt reserves have varied widely. In 2008, Haroldo Lima, Director General of Brazil's National Petroleum Agency, stated that the pre-salt could contain between 50 and 70 billion barrels of oil. In January 2011, Petrobras announced its assessment that the Lula and Cernambi fields contained 6.5 billion and 1.8 billion barrels of commercially recoverable oil, respectively. It will be some time before Brazil's pre-salt reserves are fully estimated. However, knowledge of precise reserve volumes is not critical to assessing the viability of Brazil's proposed expansion of production in the coming years. Three major categories of challenges introduce uncertainty into estimates of Brazilian production growth: financial, operational, and legislative. The costs of Brazil's pre-salt development will be immense. In July 2011, Petrobras released its 2011-2015 business plan, which outlines a $224.7 billion investment program focused heavily on exploration and production. The plan calls for a reduction in downstream investment and divestiture of foreign assets to facilitate a sharpened domestic upstream focus. Notwithstanding Petrobras' 2010 share offering of $67 billion (the largest ever), the company will still need to maintain significant operating cash flow to achieve its goals. In addition to costs, pre-salt development presents numerous technical and operational challenges stemming from the scale of the endeavor. The reserves are located more than 150 miles off Brazil's coast, making them difficult for pipelines and people to reach. Petrobras plans to purchase 45 floating production, storage, and offloading (FPSO) vessels to extract the pre-salt oil - currently fewer than 100 such ships exist in the world. Expanding Brazilian production will also require additional human capital. These challenges will be especially difficult because, unlike other Brazilian offshore ventures, Petrobras will be the exclusive operator of future pre-salt fields. Petrobras plans to train more than 240,000 technical professionals to work in the petroleum industry in the coming decade - the company currently employs just over 80,000 people. While production is underway in some of Brazil's pre-salt fields, the scaling up of production also depends on the Brazilian government's ability to arrive at an agreement on the distribution of future oil revenues. At issue is the division of revenues between the federal government, states, and municipalities. Past arrangements have predominantly benefited oil-producing states; non-producing states now want a larger share. Because revenue distribution must be set in advance of bid rounds, Brazil will not be able to conduct further auctions of pre-salt blocks until these issues are settled. While all of these challenges introduce some uncertainty into projections of Brazilian production, they are unlikely to hinder pre-salt development. What we pay for a gallon of gasoline?